Note: all recipes are listed and linked at the end of this article in the Recipe Log. Is it hot in here? Or is that just me, sweating, still sweating, during the last week of August. Still. Man, this summer has been hot! And not that I’m psyched for winter (at all), but a little break from these days of 90+ (not the wine label) and horrendous humidity would be great. I think it’s called fall? And I think it’s just about time for all the kids, of all ages, to go back to school. And when school starts, in my mind at least, it’s time for summer to slowly slink away and make way for more reasonable temperatures that make us want to eat hot food again. But until that time comes, I’m grateful for air conditioning! The dishes of the week were various options for those heading back to school because weeknights during the school year can be tough, but they always should be delicious. And everything featured this week came from Wilson Farm! Our favorite local farm for all of our weeknight dinner needs, and then some. Upon returning from the quickest trip to Maine, we got to work on meal planning and organized our dinners as best we could. Planning is entirely possible, but I always leave room for funny business, which this week turned out to be the weather! It. Was. HOT. So despite considering all sorts of fall-ish dishes, we stayed on the seasonal train and enjoyed meals (mostly) poised for late-summer. To celebrate the start of a new week, we started at the top: with steak! You see, I had found a great side-dish recipe, Wilted Greens in Tomato-Bacon Broth, but needed a protein for pairing. And since I wasn’t really in a seafood-Sunday mindset, we went for another lavish-but-possible Sunday option of NY Strip, which is Seth’s favorite cut of meat. You could definitely have this on a different weeknight (Wednesday Filet? ), but I think “Steak Sunday” has a nice, fairly elegant ring to it. And honestly, when I’m eating steak, I like to relax and really enjoy it, which isn’t always feasible once Monday - Friday begins. So Sunday steaks were had! The side dish was delicious, let’s be clear. Wilted kale with tomatoes, onion, and bacon, all simmering together to make a meal all on its own. I loved how the bacon and tomato flavors seeped into the kale and how the broth almost turned it into a soup, but not quite. The broth spilled all over my plate (not bowl) and made a huge mess, which had me in a brief panic, but you know, I worked with it. And once the steak mixed a little with that broth - oh my - it was amazing. I’m not always a fan of different items on my plate mixing, but much like the rest of my life, I’m trying to relax and not worry about it so much. There are (much) bigger fish to fry than worrying about tomato-bacon broth sliding into my NY Strip. The steak was awesome because it cooked quickly, the smoke alarm didn’t go off, and it was unbelievably flavorful with the only seasoning being salt and pepper. Cheers to my husband (👏👏) for continually upping his steak-cooking skills. For the record: we topped our steak with “fried peppers,” which were possibly one of the most delicious vegetables we’ve had this summer. Sliced Jimmy Nardello peppers cooked in butter and garlic in the same cast-iron pan as the steak (once they were removed) turned out to be the surprise element of this dish that was a stunning garnish. My anxiety and assumption that the smoke alarm will always go off while cooking meat has slightly diminished by this most recent experience. I suppose my advice for this is to just be prepared. Open all the windows and blast the fans. And hope for the best! This meatless dish, however, was a wonderful take on summer, and flavors I will definitely miss come the colder months of the year. Fresh tomatoes, corn, avocados, and cucumbers all nestled in a big bowl of greens that had a seriously delicious, and spicy, dressing underneath it all. No, I had never thought to create a spicy dressing with jalapeños and tahini, but you know, I’m thrilled! A mix of flavors that I wouldn’t normally blend together, but once again, so glad we did due to the really great result. And it had some heat! I loved that the recipe advised to put the dressing on the bottom of the bowl, then layer everything else on top, allowing for a surprise element to the dish. You never knew if your next bite would be spicy, or not! It was a wonderful shade of green that you cannot see in the photos, but trust me, it was bright. What I loved about this bowl, and not just the summery tones and spicy base, was that we had another meal that encouraged mixing of ingredients with different textures and temperatures (the corn and chickpeas were served warm from the pan!). Always a plus, in my humble, fairly-biased-about-dinner opinion. Much to my surprise, many of the comments on this dinner's recipe, Coconut Rice Noodles with Ginger and Turmeric, noted that it needed more spice, and a flash more flavor. So, even though I don’t love to change recipes too much, I prefer the original (at least on round one), for this instance we decided to edit just a smidge. We added sliced chicken for protein, cashews on top for garnish, and Seth went a little heavy-handed on the turmeric and curry powder for some oomph. We love these flavors already so adding extra was sure to enhance, not takeaway, from the original recipe. The result? So much yum! I loved the fairly simple meal, but with the chicken and cashew additions it really came to life and made me even happier with the dinner (and extra protein!). I love a semi-spicy, hot rice noodle bowl and curry is an at-home-must fairly often. What’s even better about this meal is that you could continue further down the path of creativity to really make it your own. We discussed adding in veggies next time, even more spice, or trying a different protein. The beauty of the recipe seemed to be a wonderful base, or standalone dish, depending on your mood, cravings, or current temperature. With the heat still wreaking havoc on the air, my hair, and the general positive attitude of everyone (scooping it away from us all), we made it to Wednesday with one thought: time for fajitas. Now, that’s not exactly the best mindset of what to eat on day three of a beastly heat wave, but it was part of the meal plan. And it just so happened to be exactly what I was craving that night: Chicken Fajita Bowls with Guacamole. Man oh man are we loving bowls filled with yummy ingredients this summer. I guess the creation of the bowl is part of its appeal and part of the glory: you fill a bowl with a base grain or greens, and then top it with all kinds of awesome. In this instance, we used a shredded lettuce base (skipped the rice) as well as Seth’s homemade salsa verde (omg it’s the best), which was a perfect combo to then be covered with fresh charred corn, chopped tomatoes, pinto beans, homemade guacamole (I made it! ), and an amazing mix of sautéed chicken, peppers, and onions. The marinade for the chicken was super simple (a few spices and olive oil) and really made the difference for the flavor of the meal. We let the chicken marinate for a little under an hour while we prepped everything else. While we could have left it for longer, hunger called and we had to get eating! For the time we had to let it marinate, the result was still delicious. What I loved about this dinner, besides realizing we were making an at-home version of my favorite “burrito bowl,” was that the different ingredients could be used in many other ways next time. I told Seth I’d love to use the same chicken and veggie mix in tacos; perhaps letting the chicken cook all day in a slow cooker, then shredding it before filling the tacos. Yum! And while corn and tomatoes are not seasonal for much longer, the non-local versions would definitely hold up during winter when I know I’ll crave this meal fairly often. Guacamole is a year-round food for me! Did you notice this dinner is dairy-free, too?! It didn’t dawn on me until midway through cooking, but wow! How awesome is that? Sure, I kind of wanted a little sour cream on top or a bit of sprinkled cheese on everything, but overall I didn’t really miss the dairy aspect which made this dish even healthier, in my opinion. By Thursday night, day four of this unbelievably hot week, I was strangely craving Italian food as the promise of cooler temps was on the horizon. And conveniently, our dinner matched up pretty perfectly! What I didn’t anticipate was how majorly amazing our dinner would be: Chicken (Turkey) Parmesan Meatballs, you are the best. This was a recipe I had been hearing about for a while from friends, and the Internet, as being a top-notch option from (again) What’s Gaby Cooking. I can’t apologize for featuring her recipes frequently, sometimes more than one in a week, because they’re just that good. These meatballs are freaking delicious. While we used ground turkey instead of chicken, I don’t think it had much of an affect on the final flavor. We used GF flour to coat the meatballs (as instructed) prior to cooking, and the meatballs themselves had GF panko mixed in amidst the meat and spices. Easily made gluten free! The best surprise of this dish? 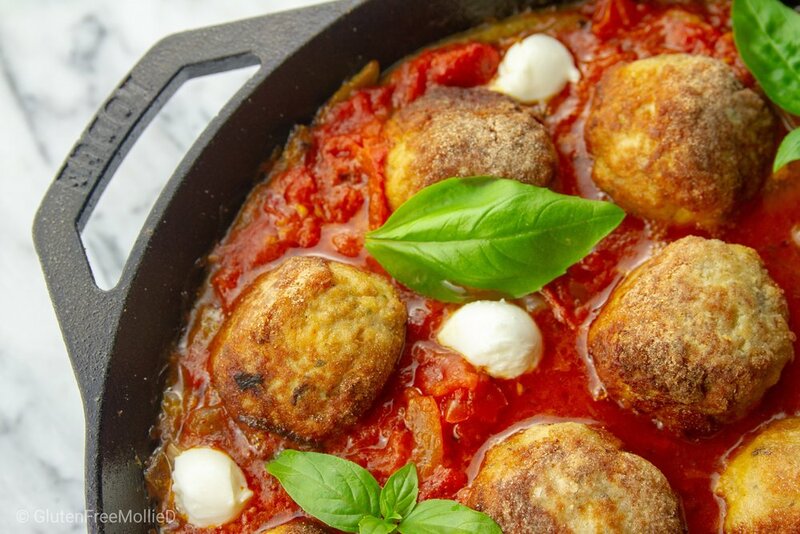 Each meatball had a full ball of mozzarella baked inside of it! Not only did this make for an even more yummy meatball, but it made sure that none of them dried out and they all had awesome, melted cheese inside! What’s better than that?! Not much. Seth made a big batch of pretty standard (minimal ingredients) tomato sauce using Wilson Farm’s own plum tomatoes earlier in the week, total cook time over three hours, so that it would be ready to go for our Thursday dinner. This simple step made our dinner prep even faster and honestly made the meal way more delicious than if we had used jarred sauce. Once Friday finally arrived, the weather decided to be nice and gave us a handful of delightful, way-less-hot days that we thoroughly enjoyed. Hooray! We made it through the heat wave. I'd definitely be OK with saying "so long" to those ultra-hot days until next summer. Our much more pleasant long weekend (it’s still going!) consisted of relaxing at home, spending time outside, a couple dinners out, and, get this, a bit of baking! Curious about the cuisine outside our home? We had a terrific meal Friday night at The Bancroft, stayed in Saturday night, and then on Sunday grabbed a quick bite at Public Kitchen. A couple of our favorite spots that have excellent GF options, always. El Barrio cocktail at The Bancroft. One of my favorites! GF mushroom pizza at Public Kitchen. Yum! NY Strip Steak with Wilted Greens in Tomato-Bacon Broth: Steak and peppers are naturally gluten free. The greens recipe is entirely gluten free as well and can be found here! 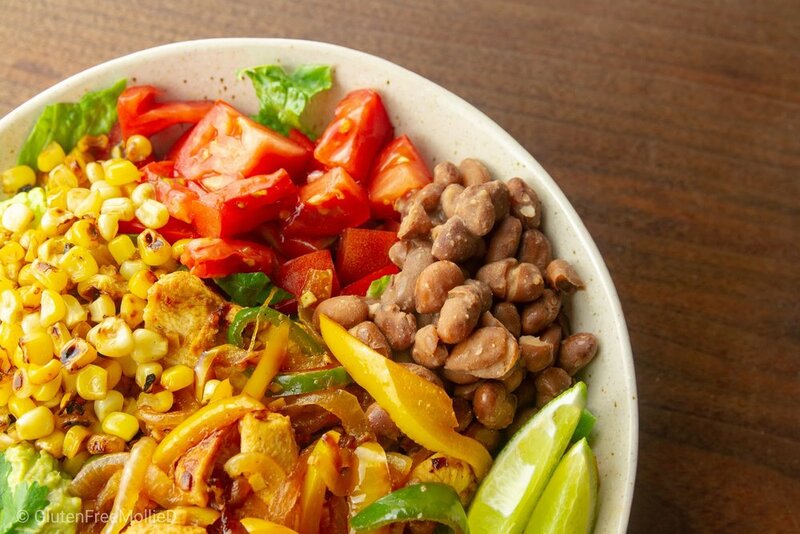 Corn and Chickpea Bowl with Miso-Jalapeño Tahini: This dish is entirely gluten free. Find the recipe here! Coconut Rice Noodles with Ginger and Turmeric: Make sure the rice noodles are labeled as GF, otherwise this dinner is entirely gluten free. Find the recipe here! Chicken Fajita Bowls with Guacamole: This dish was naturally gluten free. We decided to use lettuce as a base instead of rice, but either way it’s safely GF. Find the recipe here! Chicken Parmesan Meatballs: To make this meal gluten free make sure to use GF breadcrumbs (we use Aleia’s) and GF flour (we use Cup4Cup) for the meatballs. Otherwise, everything else in it is gluten free! Find the recipe here!